And a lot of that is to be expected, given the high academic demands within the local Great Northwest Athletic Conference D2 program. Yet all things being equal, head coach Steve Hanson had to admit Wednesday was a pretty good day. “We improved in a lot of areas (last season), but I think our number one issue, if you looked at all the analytics, was we still lacked in the rebounding department,” Hanson said, after announcing that 6-foot-11, 235-pound centre Julian Roche, a St. John, NB native and transfer from NCAA D1 Santa Clara, would join the Clan as a redshirt sophomore this coming season. Clan men’s basketball fans will relish the news that a big, long and active body, from Steve Nash’s alma mater to boot, is on his way up the hill and won’t languish on the bench. The 7-footer E.J. Christie, and 6-foot-9 Matthew O’Brien had worked hard in the classroom with the thought that each would be impact players this coming season. Yet Brampton, Ont., native Christie, who spent last season on campus in an academic year of residence, and Clackamas, Ore., native and redshirt O’Brien, were challenged in continuing that process this coming season and are no longer with the program. Meanwhile 6-foot-7 forward Aleks Vranjes (Coquitlam-Centennial) and 6-foot-8 Toronto native Tyrell Lewin both decided they needed to focus more of their energies on their futures within computer and technology industries. Vranjes left the team to devote more time to his full-time studies at the school in computing science, while Lewin left school to take a job in the tech industry. With all of that size out of the picture, Hanson and his staff had to scramble. Roche, as well as last week’s signing of 6-foot-7 B.C. AAAA tourney MVP Jusuf Sehic of Burnaby South represent two quality pieces of the puzzle, both for the present and the future. Graham Miller, the 6-foot-9 Coquitlam-Dr. Charles Best product who underwent ACL surgery in January, should be back by the 2019 portion of the upcoming campaign. And Vancouver College’s Sam Bailey, the 6-foot-7 forward who took a redshirt freshman season in 2017-18, should join the bunch as an energy forward. Like we said, moving pieces. Yet before things have a chance to settle, there seems to be a fair amount of certainty that Roche, who prepped at Proctor Academy in New Hampshire over the three seasons before enrolling at Santa Clara in 2016-17, is as much a plug-and-play transfer as the program has seen in recent seasons. “We had to find somebody to contribute right away so this was great timing and a great fit,” said Hanson of Roche, who last season played in just six games with the Broncos and is eligible to play immediately in the so-called drop down from NCAA Div. 1 to Div. 2. 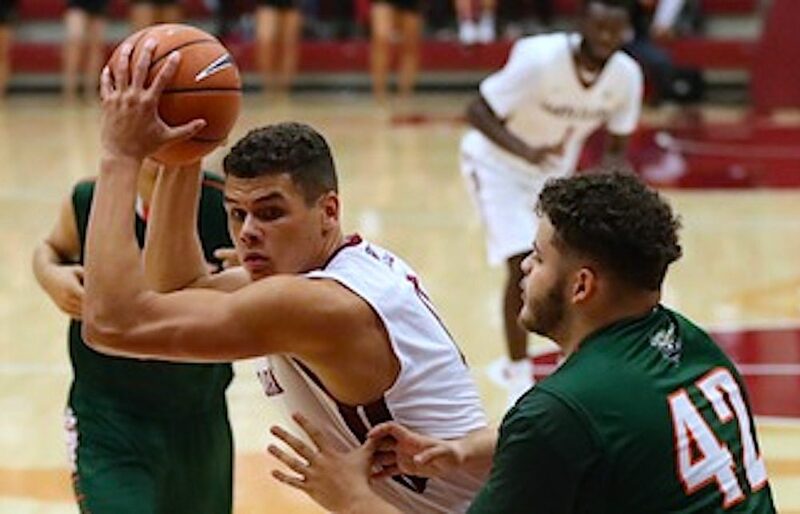 Roche was injured for part of his senior season at Proctor, and Hanson felt lucky that over his time at Santa Clara, his new big man was able to tone up for the collegiate basketball wars. However the Clan’s rotation shapes up, there is opportunity for scorers to step up following the graduation of key seniors like GNAC scoring champ and guard Kedar Salam, swingman Iziah Sherman-Newsome and rugged forward JJ Pankratz. Guards Othniel Spence, Michael Provenzano and Jordan Muir-Keung are the team’s experienced, returning backcourt trio, and they will get a lot of opportunity to build chemistry with Roche, and upon his return, Miller. Guards Bowen Bakken, Keegan Konn, Bongani Moyo, Drew Bryson and freshman recruit Wilfried Balata round out the team’s current 12-man roster. Hanson knows how hard it is to find big, ready bodies with the ability to compete immediately in the GNAC. And that’s why landing a player like Roche was very significant. On Wednesday, it was a battle they were able to win. If you’re reading this story on any website other than one belonging to a university athletic department, it has been taken without appropriate permission. In these challenging times, true journalism will survive only through your dedicated support and loyalty. VarsityLetters.ca and all of its exclusive content has been created to serve B.C.’s high school and university sports community with hard work, integrity and respect. Feel free to drop us a line any time at howardtsumura@gmail.com.